So much is taking place energetically in the world and within us. We are being challenged on every front, physically, mentally, and spiritually. We are being pushed, pulled, and squeezed, all of our stuff is coming up and we have a choice to deal with it or squash it back down. For many contracts are coming to an end or are being renegotiated. Contracts are agreements that we have with others. Contracts end or change when the core lesson has been healed or experienced as it was meant to. These can be small relationships such as acquaintances or large ones such as with your mate. The reason this is happening is because you are not who you were. Your vibration is rising and that changes everything. If your current contracts are not reflective of your new self, then they must end or be renegotiated. For some, contracts ending can appear forced upon you as they appear suddenly and change everything, for example losing your job. These type of changes tend to knock the breath out of us, but they do bring about the much needed change. It is important during these type of contract changes to keep in mind that all is in your highest good even when you can’t see it. For others, contracts ending or changing has to be done purposefully. You must see where you are not in alignment with your soul and make the changes. It is part of walking in your mastery. It is seeing what is not working, what does not match and choosing to end it or change it. It is learning to do the best for yourself in all situations. The trick with this is making sure that your ego does not become engaged as it can cause you to not see the situation clearly. Having compassion and understanding for all involved, including yourself will help. While you may have undergone deep changes as you work to embody your soul, those with whom you are interacting with may have not. To them the change may seem to come out of left field, this is where empathy is a useful tool as long as it does not hinder your growth. Quite a few are feeling that they are “going backwards” in their relationships. That ground gained has been lost. While this is disconcerting, even painful, understand that it is coming up so that you can see that there are still parts within you that match what was. It is an opportunity to not only see how far you have come but to also heal the parts within you that are still hurting. I experienced this myself in my relationship. Things came up that we had buried 15 years ago (or so we thought lol). Things had to be said to acknowledge the pain of what was to ensure that we didn’t take it into the new. While it was intense and painful, the change it brought, the closeness it has brought is completely worth it. Change is hard for all involved and often the easiest path isn’t in our highest good. I had a friend who was recently separated from his wife. He couldn’t decide if he should stay in his current state or move back home. When he inquired about moving back home he found that a job was available to him and that a family member was willing to rent him a house. On the surface this seemed like the universe telling him to go back home. Yet when we checked in with his guides, they said that he should stay in his current location, to spend time alone finding himself. That family, while comforting would be a distraction to the inner work needing to done. This baffled me because we have always been taught that if it is the right path, it will be easy. So I questioned the guides who explained that energy is like a river. For this particular person, he did whatever he could to avoid being alone and therefore created an “out” for himself (job & house in other state). The river would always flow in that direction. If he wanted to change the flow of energy, he must do the hard thing and go against the flow of the river. That yes, it would feel like swimming upstream, but that eventually it would cause the energy to flow in a whole new direction. Change is hard but necessary for our growth. As part of this energy many are feeling triggered and the common reaction is to want to avoid all things that evoke such a reaction. While avoiding certain negativity is good, avoiding life is not. Every time we get triggered it is the universe showing us that there is something within that needs healing. That each time we feel that we have “plunged back into 3D” we are being shown where we still have inner work to do. It could be that we need to work on judgement, duality, and acceptance. In some cases what triggers us is preparing us for the next phase once it is healed. For example, I have a client who has amazing healing abilities. While she would like this to be her main profession, the finances were not allowing it. She took an office job to make ends meet and is finding that she is extremely stressed (triggered). On the surface it would appear that the job is not good for her and that it was a mistake to abandon her call to heal. Upon talking to her guidance team they explained that her stress was because she was unable to let the pressures of the job go at the end of the day. This job is helping her see that she has to let it go, that she cannot control all that is taking place but that she can control her reaction to what is happening. The reason that this is so important for her to learn detachment and objectivity is because if she were to take the same attitude into the healing realm it would drain her. Healing work is so personal and it is not hard to become attached and invested, so she must learn now to let go. Her becoming triggered is her blessing, it is teaching and preparing her for the future should she choose to become a healer full time. You are so very powerful and have the ability to change all around you with an open and loving heart. 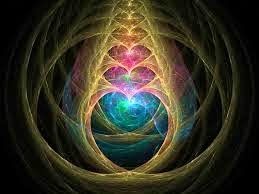 Emitting a high frequency helps you to activate it in others, planting seeds for others awakening.